Trek Wars: Revival is a mod by Captain Kavok that lets you add Star Trek factions to Empire at War, Petroglyph’s excellent Star Wars RTS. 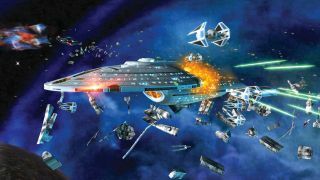 So if you’ve ever wondered if a fleet of Galaxy-class Federation starships could take down a Star Destroyer—and, honestly, who hasn’t—you can play that scenario out in the game’s fast-paced skirmish mode. The perfect opportunity, I thought, to pit a selection of iconic Star Wars and Star Trek factions against each other in a series of epic space battles. Our first battle takes place above the desert planet of Tatooine. I begin by sending my shuttles to capture two nearby asteroids so I can generate credits. Doing so as early as possible is key to victory in Empire at War’s skirmish mode. The Rebels send a small team of X-wing scouts into my territory, but my station’s automated defences chase them away. When I have enough credits, I build a couple of Miranda-class starships to protect my asteroids. Growing bolder, the Rebels send in more X-wings, but I swat them away easily. I spend a chunk of my income on upgrading my base, which unlocks my first hero unit: Captain Kathryn Janeway, commanding the Intrepid-class USS Voyager. This was, of course, the first Federation starship to successfully explore the Delta Quadrant. The Rebels send in an assault frigate to attack one of my asteroid mines and I send Janeway to intercept. Then another handful of frigates appear near my base. The Rebels have mobilised an impressive strike force, and I’m lagging behind. A huge battle breaks out and I upgrade my base as it rages, bringing in Captain Benjamin Sisko of the USS Defiant—the ship the Federation designed to fight the Borg. It’s here where I make my biggest mistake. I build three Galaxy-class starships and try and sneak them through the battle to attack the Rebel base directly. But it’s surrounded by laser defence satellites and they obliterate my ships before I can get close. A costly error. Then the Rebels send in their own hero unit: Han Solo and the Millennium Falcon. Sisko and Solo engage in a dramatic dogfight, but the Defiant is beaten. Then the Voyager is scuttled by the mass of Mon Calamari cruisers looming near my base. Things really couldn’t have gone worse. I accept defeat and watch helplessly as the cruisers pummel my HQ with laser fire. An embarrassing loss. The ice planet Hoth provides the setting for this battle. Immediately, it’s clear that luck is not on my side. There’s one asteroid beside my base, but the next nearest is in the lower corner of the map. This makes it harder to defend. I kick things off by hiring the legendary bounty hunter Boba Fett and his ship, Slave I, to protect my station while my TIE fighters make sure no one tries to sabotage my mining operations. The Klingons, bizarrely, are not as aggressive as the Rebels. They haven’t attacked once. I utilise this quiet time to upgrade my base and build a fleet of three Acclamator-class assault ships. I also research reinforced armour to give them a defensive boost, which I’ll probably need later. Then things kick off. The Klingons send in a swarm of D7-class warships to hassle me, but Fett and an accompanying wing of TIE fighters make short work of them. More Klingon ships arrive, including a mighty Bird-of-Prey. I build a dozen wings of TIE interceptors to deal with them, while I sneak my Acclamators behind enemy lines. Yes, it’s the same tactic I tried previously, but it’ll work this time. The Klingons send a few B’rel-class ships to stop me, but they’re no match for my armoured frigates. I reach the heavily defended Klingon base and begin my attack. I make a significant dent, but my Acclamators are being pulverised in the process. Time to bring out the big guns. I spend the bulk of my remaining credits to call in Grand Admiral Thrawn and his flagship, a colossal Star Destroyer called the Admonitor. My Acclamators are beaten, but before the Klingons can catch a breath Thrawn comes roaring in accompanied by Darth Vader and a wing of TIE interceptors. My own base is taking heavy damage, but I’m certain I can destroy the enemy first. I send every available unit, including Boba Fett and the rest of my home defence force, to attack the Klingon HQ and soon the station falls. A great victory for the Empire. Above the planet Naboo the next battle begins. I send my Talon-class scout ships to scope out nearby asteroids, one of which is already contested. A brief skirmish breaks out between my ships and a squadron of X-wings, but I win and claim the rock as my own. I spend my first trickle of credits on a couple of Hawk-class cruisers, the kind the Romulans use to patrol the Neutral Zone back in their own universe. As usual, the Rebels send in a few X-wings to scout my territory, but they’re easily dealt with. I recruit Romulan hero Tomalak, commander of the Deranas, a D’deridex-class battlecruiser. This thing is enormous, and suddenly I feel unbeatable. The Rebels begin to throw frigates at me, but my upgraded base’s defences and Buzzard-class cruisers are doing a good job of keeping them at bay. While they’re distracted there I collect the rest of my fleet together. I recruit another hero, Sela, who TNG fans will know is the daughter of an alternate universe Tasha Yar. She commands another huge Warbird, making my fleet look nicely intimidating. It’s time for an assault. I send scout ships ahead to locate the Rebel base. While I do so, Han Solo and a squadron of X-wings attack my fleet. Solo puts up a good fight, and manages to drop the shield of Sela’s ship, but the sheer power of my armada is too much. The Falcon explodes dramatically as my scouts reveal the enemy base, setting the stage for the final assault. I move every ship I have towards the Rebel station. It puts up a fight, but it hasn’t been upgraded much and in minutes it’s falling apart and spewing flames. I watch as my Warbirds tear the base apart and earn a glorious victory for the Romulans. Coruscant, capital of the galaxy, is where the final skirmish will take place. I kick off as usual by sending shuttle scouts out to set up mining facilities on asteroids. I grab a few on the edges of the map, but in the centre I see a tantalising trio of rocks in close proximity. I send a Miranda-class ship in to investigate, but the Empire already has firm control of it. That’s serious cashflow for them, and bad news for me. So I decide to switch up my tactics and try something new. I focus entirely on base upgrades until I’m able to build Galaxy-class ships, then I begin creating my armada. I don’t bother with upgrades or anything else. I just keep building Galaxy-class starships. Every time I reach 4,000 credits I build one, and repeat. After about ten minutes I’m commanding seven of the beasts, each of which has its own squadron of shuttle fighters. And now it’s time for a bit of shock and awe. I recruit Federation hero Jean-Luc Picard of the Enterprise-E who leads my fleet of Galaxies towards the enemy base. The Galactic Empire sends a cluster of Star Destroyers after me, and a thrilling conflict breaks out. Lasers and phasers crisscross the battlefield as the Destroyers and Galaxies trade blows and swarms of smaller fighters dogfight around them. It’s terribly exciting. Two of my Galaxies sacrifice themselves for the cause, bursting into flames and exploding against the stars. Picard survives the ambush and takes the lead once again. I push forward through the front line towards the Imperial base. Laser defence satellites cause me some problems and drop a few of my ships’ shields, but I reach the station and begin an all-out assault. The sight of my ships circling the Empire’s base and pummelling it with photon torpedoes is a beautiful one, and eventually it begins to break apart. I can just picture Picard on the bridge, calmly asking for a damage report, secretly celebrating a successful mission. A solid win for the Federation. Well, I was going to use the results of these battles to determine if Star Wars or Star Trek was the better space-faring franchise. But in the end it was a draw: two wins for Star Wars, two wins for Star Trek. And there’s something beautiful about that. I’m not sure what exactly drives Empire at War’s fairly unpredictable skirmish AI, but it was a lot more aggressive in the first fight, utterly mauling me with a huge armada—and this was only on medium difficulty. This is a fantastic mod with an impressive attention to detail. I love how it changes the HUD to look like Star Trek’s LCARS computer interface. And the sound effects, especially the Federation’s phasers and photon torpedoes, are spot on. If you want to give it a go yourself, search for Trek Wars: Revival on Mod DB. There’s just something fundamentally entertaining about watching iconic ships from these two series fight each other, trading blows in the infinite vacuum of space.